As exciting as it was to watch Barry Bonds surpass Hank Aaron’s 755 career home run mark and set a new all-time MLB record with 762; just imagine if he hit 800 long balls…and then just kept on going! That’s precisely what Japanese slugger Sadaharu Oh did when he belted out 868 career blasts, including 30+ round-trippers for 19 consecutive seasons. Known as “The Japanese Babe Ruth,” Oh is considered by many to be the greatest home run hitter of all time. Among his feats were a four home run game in 1964 and hitting home runs in seven consecutive games in 1972. So it is only fitting that he wore the uniform #1 throughout his 22-year career (1959-80). 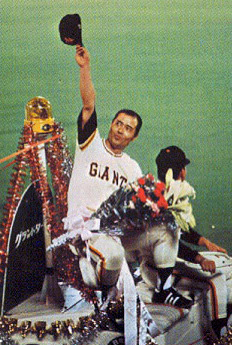 A nine-time Nippon league MVP, Oh holds the Japanese single-season home run record (55 in 1964). 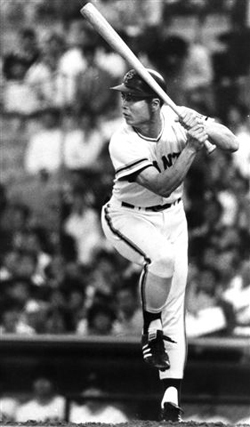 But he also hit for average, leading the Japanese Central League five times and driving in 2,170 RBIs; while maintaining a lifetime batting average of .301 and winning consecutive Triple Crowns for the Tokyo Giants (1973-74). One of the key factors in his incredible lifetime batting average was the fact he was an extremely well disciplined hitter who seldom swung at a pitch outside the strike zone. He averaged a walk per game. Oh was famous for the unique batting stance, which was designed for him by Tokyo Giants’ hitting coach Hiroshi Arakawa in 1962. The Giants' hitting coach, Arakawa was also a swordsman of some repute. He taught the left-handed Oh to hit using principles applied by swordsmen. It involved Oh raising his leg toward the plate but required tremendous practice and discipline to perfect. Those who contend that Sadaharu Oh would not have hit as many long-balls had he played in America, here’s a look at how he matched up against MLB players of his era. In 13 Japan series games, Oh hit 25 home runs against visiting pitchers including: Hall-of-Famers Steve Carlton, Jim Palmer and Tom Seaver.